I LOVE fried chicken – who doesn’t??? The salty, crispy skin coating that succulent, moist chicken. HEAVEN! 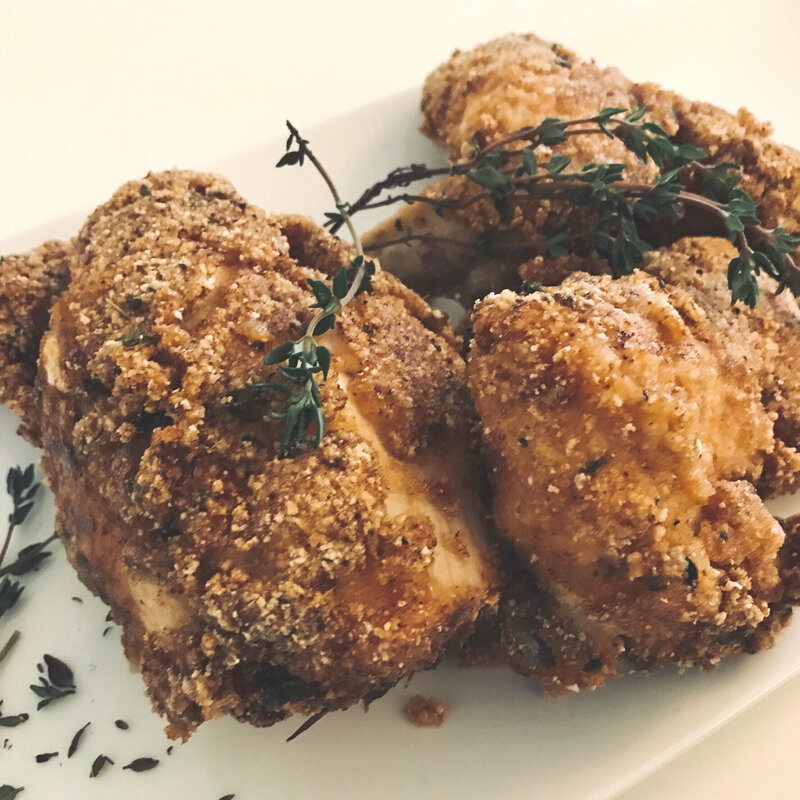 It may not be the right time of year to be making fried chicken but with the few and sporadic spring like days making an appearance here in the UK, we may as well just carry on hibernating and eat some real good comfort food…this is my excuse, in case one is needed. I spent a little while perfecting this dish as unlike using plain flour to make ‘regular’ fried chicken, I decided I wanted to use rice flour rice and gari to form a coating for my own fried chicken. If you’ve made my spicy mango and gari salad, you’ll know that gari is cassava that is grated, dried and then fried. Gari can be a little woody in flavour and texture, and with it being dried and fried, I came to realise when recipe testing I had to fry the chicken in a little lower temperature so that the coating did not cook too fast and burn, whilst still ensuring the chicken was cooked through and not greasy. But I got there! Put the buttermilk, thyme, garlic cloves, a good pinch of salt and cracked black pepper into a tupperware, mix and then put the chicken into the mixture. Leave to sit in the buttermilk mixture overnight in the fridge, or for at least 3 – 4 hours. Put the vegetable oil onto a medium heat in a deep pan or frying pan. You want the oil to reach 150⁰C. While the oil is heating mix together the rice flour, gari, baking powder, paprika, thyme leaves removed from the stalk and chilli powder in a wide based bowl or a tray, and season with salt and pepper. Use one hand to remove the chicken from the buttermilk mixture and place in the bowl of the gari mixture, and use the other hand to coat each piece of chicken one by one and place on a plate ready to fry. Check the temperature of the oil and when it has reached 150⁰C, place the coated chicken into the oil using a slotted spoon. You might need to cook them in batches depending on the size of your pan. Cook for 15 – 20 minutes depending on the size of the cuts of chicken. I check at about 13 minutes if the juices from the chicken are close to running clear to gauge how much longer is needed for it to be fully cooked to the bone. Remove from pan and place on kitchen paper towel to absorb any excess oil.